A reader of JUST GENESIS left a comment after reading the article Why Prejudice Against A Scientific Approach to the Bible? This was the question asked by Manna: "Is archeology biased and based more on a european type of model than facts? Or, is current research and evidence dismantling the bias of the past? Are we closer to a more accurate picture or further away?" 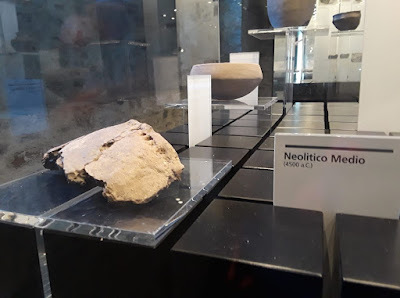 I responded that archaeological findings constitute important physical evidence, but artifacts are often misinterpreted or assigned significance that is not consistent with the larger picture. I have seen many examples of this over the years. One example is the unfortunate misrepresentation of the solar image overshadowing the queen at the Yazilikaya shrine in Turkey (shown below). This relief of great significance shows the divine appointment of a royal couple. 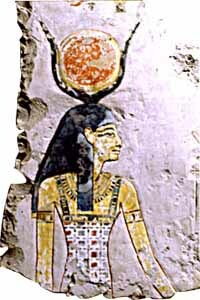 The woman wears the Sun in the horns as a sign of divine overshadowing of the Sun, the Creator's emblem. This is consistent with the image of Hathor, the mother of the "son" of the Creator (shown right). Hathor was venerated among Abraham's Horite Hebrew ancestors as the mother of Horus. She was also venerated among his kinsmen, the Hittites. 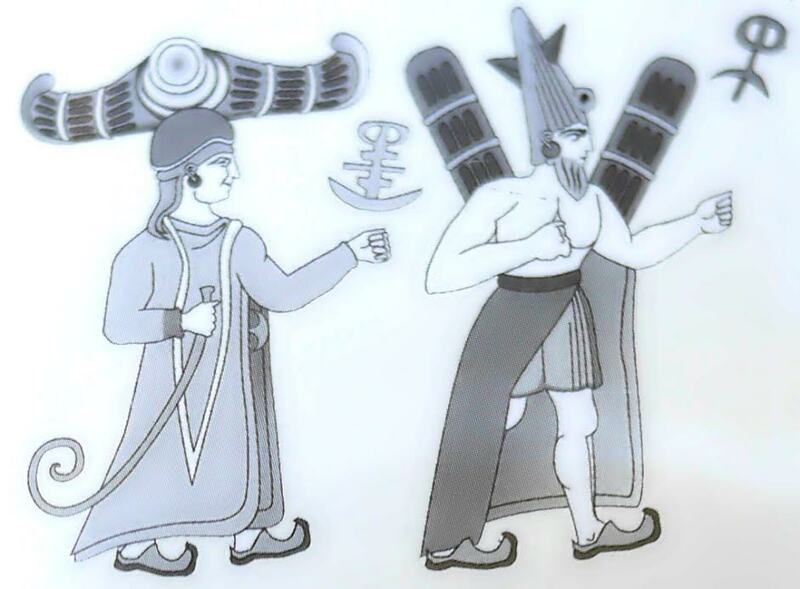 Solar imagery is a key feature of the religion of the archaic rulers (the "mighty men of old") and it involved expectation of a divine ruler who would overcome death and lead his people to immortality. That righteous ruler was understood to be the son of God. He is called Horus or Enki in ancient texts. He was to be conceived by divine overshadowing of a dedicated royal virgin (Luke 1). It is common that interpretations of the past are set aside when fresh eyes investigate the evidence. There is always resistance to new approaches such as Biblical Anthropology which does not rely on a single discipline, but rather seeks to gain a wider picture by looking at multiple sciences, including linguistics, DNA studies, anthropology and climate studies. The king also wears the horns as a solar crown indicating divine appointment as the Creator's representative on Earth. Unfortunately, archaeologists missed this entirely. They interpreted this image as Sun goddess (left) and Moon god (right), thus rendering the meaning exactly opposite of what is depicted. Among the peoples of the R1b Haplogroup (which includes Hebrew and Hittite peoples) the Creator was consistently associated with the Sun and divine insemination. "I think the reason people ask you "what color was Abraham?" is because your research goes even against the images of Abraham and others in the Old Testament...Those images for many are not African based at all. I grew up down south (the Bible belt of America) and there was nothing of any "red, dark, ruddy, brown, dark, etc" skin tones in images of Abraham, etc. in those early books of Genesis. I think the resistance is so deep that even some researchers and scientist cannot accept such--even despite the clear evidence. Some people will never accept a "ruddy, brown, red, olive or even dark" type of Abraham. Does it matter? For some of us, it does for many different reasons." To Manna, I responded, "The assertion of a red skin tone for Abraham is strictly based on the data of the Bible." Let us consider some of the pertinent data of the Bible and see how it aligns with scientific findings. Abraham was a descendant of Adam. Adam refers to the color of blood. Adam is named as the founding ancestor of the rulers listed in Genesis 4 and 5. These are the ruling lines of Kain and Seth, and analysis of the marriage and ascendancy pattern of these rulers reveals that the lines intermarried. This practice is called "endogamy" and endogamy is a trait of ruling houses as well as the priest caste of the ancient world. Abraham also was a descendant of Kush, a Nilotic ruler of the Upper Nile Valley where red Nubians lived. 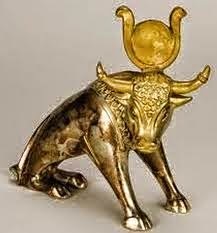 His ancestors were Proto-Saharan cattle herders for whom the Sun was a sacred image, the emblem of the Creator who appoints rulers by divine overshadowing. The image below is actually a Messianic image of the calf of God to be sacrificed to make atonement for the people. This is why Aaron, a descendant of Seir the Horite ruler of Edom, fabricated such an image (see diagram above). One of Abraham's ancestors was Noah, a proto-Saharan ruler in the region of Lake Chad. There has been resistance to this assertion among men who have written books in which they present Noah as a Mesopotamian.Yet none has been able to refute the assertion that Noah was a proto-Saharan ruler because it aligns with biblical data and with findings in linguistics, genetics, anthropology, archaeology and climate studies. Lake Chad and the Upper Nile were populated by people in the R1b Haplogroup (Y-DNA). This Haplogroup is African, Eurasian, and European, as is evident from this map. The evidence of the Bible and various sciences indicate that this is the haplogroup of the Horite Hebrew. In Noah's time there was a famous shrine city on the Nile called Nekhen. At Nekhen, archaeologists found a redheaded man in Burial no. 79. The facial hair of the man in Burial no. 79 had been trimmed with a sharp blade. 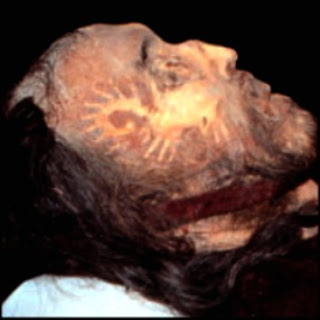 The presence of long wavy natural red hair and a full beard suggests that this individual may be of the same ethnicity as the red haired rulers known as Ur-David (shown below) buried in a pyramid in the Tarum Valley of China. Abraham's territory was entirely in the land of Edom, ruled by Horite Habiru/Hebrew kings. Many are listed in Genesis 36. Edom and Adam share the same dm root which refers to the color red. 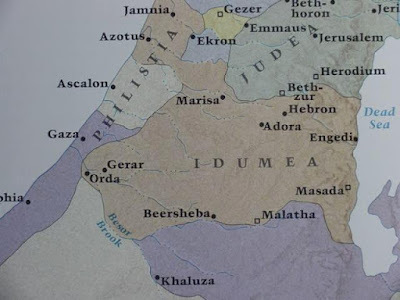 The ancient Greeks called Edom "Idumea" which means land of red people. 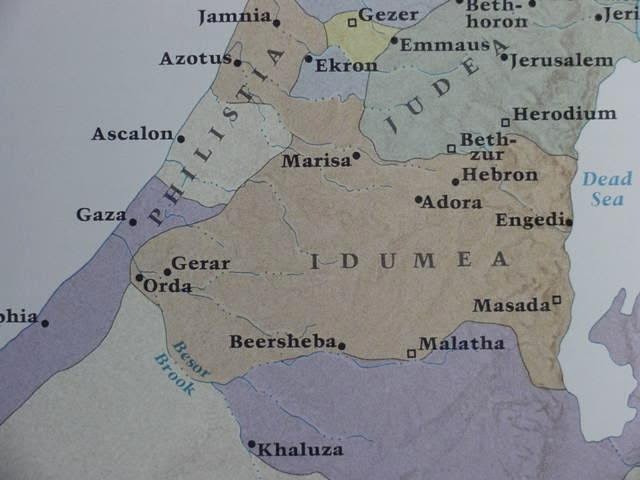 Note that both Hebron (where Sarah lived) and Beersheba (where Keturah lived) are in Idumea. Abraham's territory extended between the settlements of his two wives and was entirely in the region the Greeks called Idumea. David and Esau are decribed as red or ruddy in the BIble. 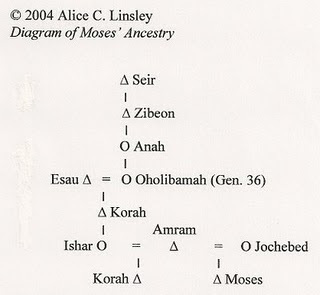 In the Genesis 36 king list, diagrammed below, we find that Esau the Elder married his cousin Adah, the daughter of the Hittite chief Elon. His other wife was Basemath, also a daughter of Elon. Esau the Younger married Oholibamah, the daughter of the female clan chief Anah. David was a descendant of Abraham and he had Edomite blood, as did many of the great rulers of Israel, including Herod the Great whose ancestry is found in Horite Petra. Genesis 36:1 reports that kings ruled in Edom before there was a king in Israel. The Edomite ruling house is one of great antiquity.